Few Egyptians heeded a call to carry out an uprising to impose Islamic law and preserve Egypt's "Muslim identity" in planned Friday protests, while militant attacks and clashes killed three. A limited number of protests kicked off in several governorates across the country, but not much larger than the normal weekly protests staged by supporters of Islamist president Mohamed Morsi, who have seen their street presence dwindle amid a police crackdown that has killed hundreds and landed thousands in jail. Friday's protests were called for by the Salafist Front, a small ultraconservative Islamist group, and were backed by the Muslim Brotherhood. "The media blew worries about the protests out of proportion. The Islamists definitely failed today," political analyst Amr Hisham Rabei told Ahram Online. The relative calm of the day was broken by militant attacks as two army officers were killed in drive-by shootings by unknown assailants in Qalioubiya governorate, north of Cairo and Gesr El-Suez in Cairo. Improvised explosives were also thrown at security forces in the Nile Delta's Sharqiya governorate, injuring two policemen and eight civilians. Small protests in Cairo and Alexandria turned violent as protesters clashed with police. 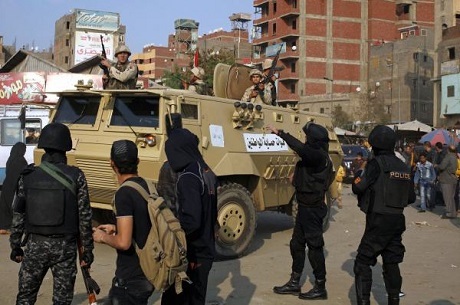 A man, 42, was shot dead amid clashes between police and protesters in Cairo's eastern Matariya district, a health ministry spokesman, Hossam Abdel-Ghaffar, told Ahram Online. It is unclear whether the man was taking part in the protests or was passing by, Abdel-Ghaffar said. Matariya has witnessed near-weekly Friday clashes between Brotherhood supporters and police in the months following Morsi's ouster in July 2013. Last month a child was killed in similar clashes in the district. Two other officers – one from the police, another from the army – were injured during clashes with Islamist supporters in Alexandria. The clashes in Cairo and Alexandria were the largest reported. More than 20 people have been injured nationwide, Abdel-Ghaffar said. Friday's limited violence occurred despite heightened security measures taken across Egypt in anticipation of the protests, with security forces deployed in major squares and at key buildings. Many shops closed their doors across the country on Friday and fewer people than usual roamed the streets in the capital and elsewhere. There were several small demonstrations in the late afternoon to express support to the government in Mansoura and Mahalla in the Nile Delta, as well as Alexandria and Cairo. Earlier on Friday, police said they arrested 107 alleged Brotherhood members for intending to carry out acts of violence, state-run news agency MENA reported. The figure increased as dozens were rounded up by police during the day. A police spokesperson said 224 protesters were arrested nationwide. At least 10 small improvised bombs were defused in four governorates, including Cairo, the police said. Two sound bombs detonated in highly secured areas of Cairo – in Abdel-Moneim Riad Square, walking distance from Tahrir Square, and near the presidential palace east of Cairo. Unlike the Brotherhood, several other Islamist groups including the Salafist Nour Party – an ally of the government – and former Brotherhood allies the Wasat Party and Al-Gamaa Al-Islamiya movement rejected the demonstrations. Egypt's Prime Minister Ibrahim Mahlab on Thursday had declared that Friday would be a "normal day." The Egyptian elites/privilege class that ruling for many decades with the collaboration with Junta were threaten first time by the un-privilege class Egyptians uprising in 2011 revolution. The media that owned by this class with support of Junta and Judiciary divided them again and now again came to power. This class knows that whenever un-privilege class again united they will be again thrown out.The divide of secular, liberal, islamist, salafi, copt and MB is serve the purpose of Junta and elite class.The media & elite class rhetoric is only pushing to un-privilege class to be more radical and to take guns instead of take the path of democracy.The Junta and its loyal elite class knows they never maintain their rule through fair elections. Do you mean the poor ignorant type? Is that what you want to say? What does that mean? Look whoever grabs a weapon, doesn't have to be "un-privileged", it is usually the most educated ones, those bored out of cynicism, easily swayed or bought by those that profit from instability. You sound like a real agent provocateur suggesting that those who will soon start a armed uprising are merely the "poor un-privileged Egyptians" and not some mostly imported, paid and drugged youths to further some political agenda. Funny, most of those you would call "un-privileged" are quite content with El-Sisi as they suffer the most from any instability in the country. Democracy means the majority rules, and you want to push your minority views on the majority? Don't lecture anymore. You guys are going to fail! Ta7ya Misr. On the other hand the Muslim brotherhood helped unite Egypt. All classes, minorities, the military, and the overwhelming population of Egypt united to fight, and eliminate the Muslim brotherhood terrorists. For that and that alone the terrorists served a purpose. Terrorists gathering in all places is to be monitored.At least For a month, Prayers in the Mosques should be banned. Egypt is in a state of war.Unless Al Sisi takes stren actions like this, I see no solution.These terrorist will keep coming. That sounds like something a terrorist WOULD say. How would you feel to ban all prayers in Churches? Or Synagogues? Shame on you. All the people are the same, Muslim Brotherhood, Salafist front,Islamic revolution,Government,army, Muslims and Christians. The end of day we are Egyptians, most of us are working in the Government or Private Business. The same Government Corrupts Egypt and poor Egyptians everyday. All The private Business prices are like sharp knives. I have been to Egypt last year and all I saw people steal from each other. So the message is clear and short, Please we need to look at ourselves First and always we need to put Egypt first too. No matter how good or bad you think life is, wake up each day and be thankful for life. Someone,somewhere else is fighting to survive. God save Egypt. We need to create a buffer zone in the heart of Cairo. We need to demolish the following districts in order to isolate the terrorists: Shbra, Imbaba, Sayyeda and Misral-Gadida. We must also seek to dry up all rivers, including the Nile in order to make the terrorists die of thirst. Yahya Sissi, Tahya Misr. Is Daish worse than Israel and America? Israel massacred tens of thousands and America murdered sever millions. Ostazia: May be sissi is dealing with stupid people like you. But we are not stupid..
You guys don't even have a good sense of humor. Another good reason to purge Egypt from all you Muslim Brotherhood and fanatic Islamists which all support Daesh and Qaeda. Whoever says they don't, is lying or unaware of the connections in the upper tiers of your Pyramid structured Global Terrorist Network. ISA President El-Sisi will succeed and we can live in peace here without your violence. Ta7ya MISR!!! !